Hello my beautiful Denver Community! First off, I hope everyone’s thoughts and prayers are going to those being affected by the fires. G-d willing they will come to an end, quickly, and no more homes and lives will be affected. On a bit of a brighter note, I have 2 Israeli Chef’s coming to Denver! They will be leading 3 cooking demonstrations, (and possibly a 4th, for kids, as well)! 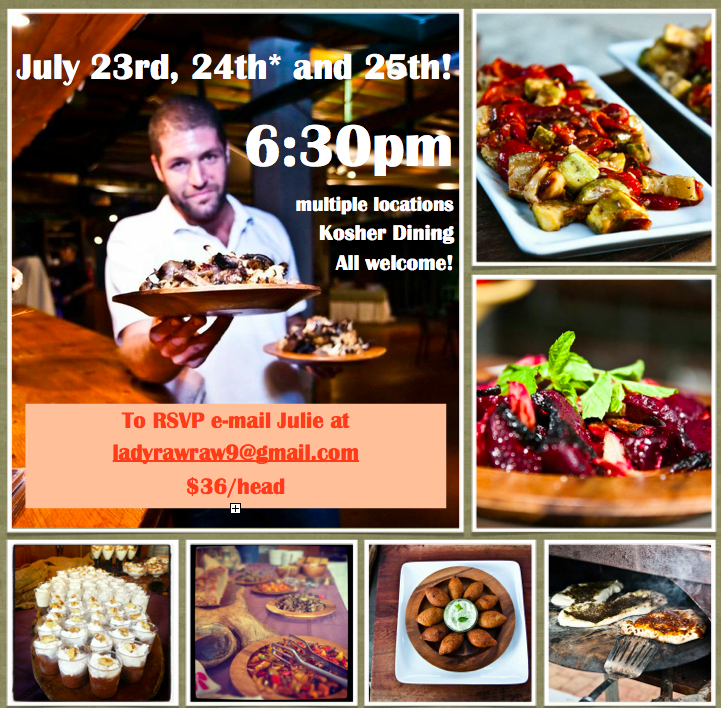 These chef’s are close friends of mine, and I would love to show them some Denver support (with the hopes that when I make Aliyah in September, I might have a job… 😉 SO PLEASE, shoW me, and them, some support by attending one of the cooking classes they will be offering! Details are below. Feel free to share this information with everyone who might want to attend! Space is limited, so reserve your spot ASAP! ← Chef Raw Raw is back in action!